: The principal control device on any engine is the governor. It governs or controls the engine speed at some fixed value while power output changes to meet demand. This is achieved by the governor automatically adjusting the engine fuel pump settings to meet the desired load at the set speed. Governors for diesel engines are usually made up of two systems: a speed sensing arrangement and a hydraulic unit which operates on the fuel pumps to change the engine power output. A flyweight assembly is used to detect engine speed. Two flyweights are fitted to a plate or ballhead which rotates about a vertical axis driven by a gear wheel . The action of centrifugal force throws the weights outwards; this lifts the vertical spindle and compresses the spring until an equilibrium situation is reached. The equilibrium position or set speed may be changed by the speed selector which alters the spring compression. As the engine speed increases the weights move outwards and raise the spindle; a speed decrease will lower the spindle. The hydraulic unit is connected to this vertical spindle and acts as a power source to move the engine fuel controls. 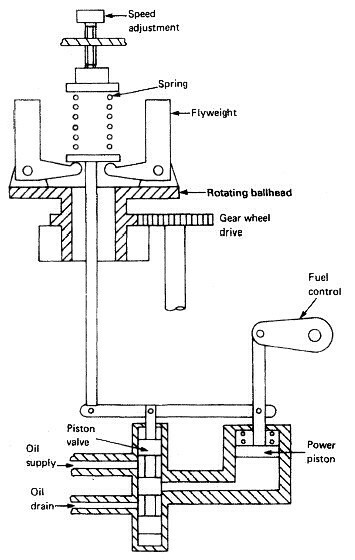 A piston valve connected to the vertical spindle supplies or drains oil from the power piston which moves the fuel controls depending upon the flyweight movement. If the engine speed increases the vertical spindle rises, the piston valve rises and oil is drained from the power piston which results in a fuel control movement. This reduces fuel supply to the engine and slows it down. It is, in effect, a proportional controller . The actual arrangement of mechanical engine governors will vary considerably but most will operate as described above. The electric governor uses a combination of electrical and mechanical components in its operation. The speed sensing device is a small magnetic pick-up coil. The rectified, or d.c., voltage signal is used in conjunction with a desired or set speed signal to operate a hydraulic unit. This unit will then move the fuel controls in the appropriate direction to control the engine speed. These must be fully operational and regularly tested in accordance with manufacturers’ instructions. Attention is drawn to the testing of over speed trip and protection devices. The condition of the linkage coupling the engine’s fuel pump actuating levers and the governor is also to be regularly examined. The governor cannot compensate for either seized fulcrum pins or excessive clearances. The two-stroke cycle is completed in two strokes of the piston or one revolution of the crankshaft. In order to operate this cycle where each event is accomplished in a very short time, the engine requires a number of special arrangements. There are two possible measurements of engine power: the indicated power and the shaft power. The indicated power is the power developed within the engine cylinder and can be measured by an engine indicator. The shaft power is the power available at the output shaft of the engine and can be measured using a torsionmeter or with a brake. A basic part of the cycle of an internal combustion engine is the supply of fresh air and removal of exhaust gases. This is the gas exchange process. Scavenging is the removal of exhaust gases by blowing in fresh air. The fuel oil system for a diesel engine can be considered in two parts—the fuel supply and the fuel injection systems. Fuel supply deals with the provision of fuel oil suitable for use by the injection system. The lubrication system of an engine provides a supply of lubricating oil to the various moving parts in the engine. Its main function is to enable the formation of a film of oil between the moving parts, which reduces friction and wear. The lubricating oil is also used as a cleaner and in some engines as a coolant. Cooling of engines is achieved by circulating a cooling liquid around internal passages within the engine. The cooling liquid is thus heated up and is in turn cooled by a sea water circulated cooler. Without adequate cooling certain parts of the engine which are exposed to very high temperatures, as a result of burning fuel, would soon fail. Diesel engines are started by supplying compressed air into the cylinders in the appropriate sequence for the required direction. A supply of compressed air is stored in air reservoirs or 'bottles' ready for immediate use. Up to 12 starts are possible with the stored quantity of compressed air. The principal control device on any engine is the governor. It governs or controls the engine speed at some fixed value while power output changes to meet demand. This is achieved by the governor automatically adjusting the engine fuel pump settings to meet the desired load at the set speed. The cylinder relief valve is designed to relieve pressures in excess of 10% to 20% above normal. The operation of this device indicates a fault in the engine which should be discovered and corrected. As a practical safeguard against explosions which occur in a crankcase, explosion relief valves or doors are fitted. These valves serve to relieve excessive crankcase pressures and stop flames being emitted from the crankcase. They must also be self closing to stop the return of atmospheric air to the crankcase. The turning gear or turning engine is a reversible electric motor which drives a worm gear which can be connected with the toothed flywheel to turn a large diesel. A slow-speed drive is thus provided to enable positioning of the engine parts for overhaul purposes. It is one of the MC series introduced in 1982, and has a longer stroke and increased maximum pressure when compared with the earlier L-GF and L-GB designs. Shell and tube heat exchangers for engine cooling water and lubricating oil cooling have traditionally been circulated with sea water. The sea water is in contact with the inside of the tubes, tube plates and water boxes. Piston forms the lower part of the combustion chamber. It seals the cylinder and transmits the gas pressure to the connecting rod. The Piston comprises of two pieces; the crown and the skirt.The crown of a piston is subject to mechanical and thermal stresses.